The Holy See announces sanctions against former American Cardinal, Theodore Edgar McCarrick, including dismissal from the clerical state. The Holy Press Office has published a statement from the Vatican Congregation for the Doctrine of the Faith, concerning the case of Theodore Edgar McCarrick. In September 2017, the Archdiocese of New York reported to the Holy See accusations against then-Cardinal McCarrick, for allegedly abusing a male teenager in the 1970’s. Pope Francis ordered an in-depth investigation into the allegations, to be carried out by the Archdiocese of New York. At the conclusion of this inquiry, all relevant documentation was transmitted to the Congregation for the Doctrine of the Faith, which is charged with investigating cases of sexual abuse by the clergy. The results of the New York Archdiocesan Review Board investigation, were announced by Cardinal Timothy Dolan in June 2018. The Board found that the allegations against McCarrick were “credible and substantiated”. In his statement, Cardinal Dolan announced that, at the direction of Pope Francis, Cardinal Pietro Parolin, the Vatican Secretary of State, had instructed McCarrick that he was “no longer to exercise publicly his priestly ministry”. The statement also noted that McCarrick had cooperated with the investigation, and accepted the decision of the Holy See, while maintaining his innocence. On the same day, the Diocese of Metuchen, and the Archdiocese of Newark, both in New Jersey, revealed that they were aware of past allegations of sexual misconduct by McCarrick, including two that had resulted in legal settlements. In the weeks following the announcement of the initial allegations against McCarrick, news sources published further accusations of misconduct against adult seminarians, as well as additional accusations of abuse of minors. On 28 July 2018, the Holy See announced that Pope Francis had accepted McCarrick’s resignation from the College of Cardinals, and “ordered his suspension from the exercise of any public ministry, together with the obligation to remain in a house yet to be indicated to him, for a life of prayer and penance until the accusations made against him are examined in a regular canonical trial”. On October 6, 2018, a statement of the Holy See strongly affirmed: “Both abuse and its cover-up can no longer be tolerated and a different treatment for Bishops who have committed or covered up abuse, in fact represents a form of clericalism that is no longer acceptable”. The statement reiterates Pope Francis’ “pressing invitation” to “to unite forces to fight against the grave scourge of abuse within and beyond the Church, and to prevent such crimes from being committed in the future to the harm of the most innocent and most vulnerable in society”. Ahead of the upcoming meeting in the Vatican of Presidents of Bishops’ Conferences of the world, set to take place from 21 to 24 February 2019, the statement emphasizes the words of Pope Francis in his Letter to the People of God: “the only way that we have to respond to this evil that has darkened so many lives is to experience it as a task regarding all of us as the People of God. This awareness of being part of a people and a shared history will enable us to acknowledge our past sins and mistakes with a penitential openness that can allow us to be renewed from within” (20 August 2018). On 7 October 2018, Cardinal Marc Ouellet, Prefect of the Congregation for Bishops, published an open letter in response to accusations by the former Papal Nuncio to Washington DC, concerning the McCarrick affair. In the letter, Cardinal Ouellet asks how it was possible that a man like McCarrick, could have been promoted on several occasions, to the point of being named Archbishop of Washington and being created a Cardinal. The letter notes that personnel decisions taken by popes are based on the best information available at the time and constitute prudential judgments that are not infallible. Cardinal Ouellet also points out how skillfully McCarrick defended himself against the allegations raised in his regard, and notes that, once real evidence became available, strong decisions were taken. Cardinal Ouellet’s letter continues, stating how, during the pontificate of Pope emeritus Benedict XVI, McCarrick was “strongly urged” not to travel and not to appear in public. McCarrick disregarded these instructions. Cardinal Ouellet clarifies that these directives were not "sanctions" imposed by Benedict XVI, and repudiates the suggestion that any sanctions were lifted by Pope Francis. He notes also that the present Holy Father "had nothing to do with McCarrick's promotions in New York, Metuchen, Newark and Washington”, and removed him from his dignity as a Cardinal when an accusation of abuse of a minor was deemed credible. 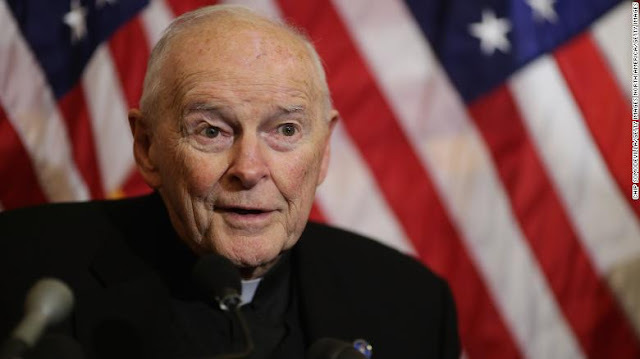 Theodore Edgar McCarrick, 88, was born in New York on 7 July 1930. He was ordained priest by Cardinal Francis Spellman on 31 May 1958. He was appointed Auxiliary Bishop of New York in May 1977 by Pope Saint Paul VI, and consecrated on 29 June 1977. Pope Saint John Paul II appointed him first Bishop of Metuchen (1981-1986), Metropolitan Archbishop of Newark (1986-2000), and Metropolitan Archbishop of Washington (2000-2006). On 21 February 2001 he was created Cardinal. McCarrick took part in the conclave of 2005, which elected Pope Benedict XVI.